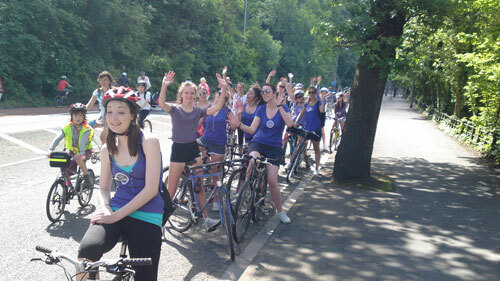 On 20 June a group of friends from Redland High School took part in Bristol's Biggest Bike Ride. Shirran writes "It was such a beautiful day and there were 27 of us riding, we looked like such a team! Many of the riders who were not so confident managed to pull through and we all finished together! It was so much fun for all of us and we said along the way that it was exactly what Yvette would have taken part in! You can still sponsor the girls by clicking on the picture to go to their JustGiving page. This chant was created while we rode to spread the message and explain to people why we were all wearing purple! Everyone who heard this chant were smiling and cheering for us! So if you love us scream and hollah!